Today being communicated (or online) most of the time is essential. Instant messaging programs and social networks are often our meeting place (virtual) friends, associates or acquaintances. That’s why I found an interesting comment about the MSN app that integrates with Twitter. 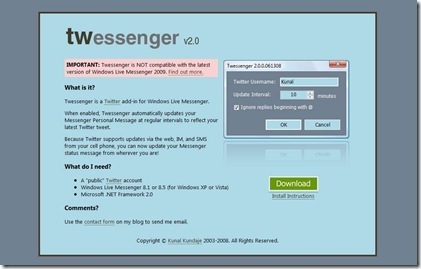 His name is Twessenger, and allows us to update our Windows Live Messenger status with the last message posted on Twitter. Perhaps to many it may seem unnecessary, however if you use MSN much, this tool can make things easier, especially if you work as a freelance or spend too much time online.